Selkirk Recycling Centre will re-open on Monday 25 July. Why was Selkirk Recycling Centre closed? The Riverside facility was closed in February to allow for a diversion route for the Selkirk Flood Protection Scheme to be extended through the former recycling centre site. At the same time, the centre was reconfigured to get as much waste as possible into the skips and reduce the need for short-term closures of the site while skips are being emptied. All the previous facilities within the recycling centre have been retained. The closure was essential to allow Level Crossing Road to be extended through the former recycling centre site. This work means homes and businesses can still be accessed while the installation of a new culvert requires a section of Dunsdale Haugh road to be shut. “I am delighted Selkirk Recycling Centre has re-opened after a lengthy closure period. “We realise the closure has caused an inconvenience to people of Selkirk but it was vital to ensure homes and businesses in the Riverside area of the town were not adversely impacted. “Recycling centres play an important role in supporting the Council’s kerbside waste and recycling collection services. For example, Selkirk Recycling Centre helped to divert 832 tonnes of waste from landfill in 2015. This ensured the Council saved over £65,000 in landfill tax. Selkirk Flood Protection Scheme will provide long-term protection to almost 600 properties in Selkirk against major flood events. The main construction work on the £31.4million project is still in line to be completed by December this year. More information on Selkirk Flood Protection Scheme is available. View our Selkirk Recycling Centre information leaflet. 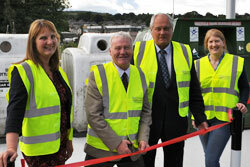 An image of the re-opening of the Selkirk Recycling Centre is available on our Flickr page. More information on waste and recycling services is available.